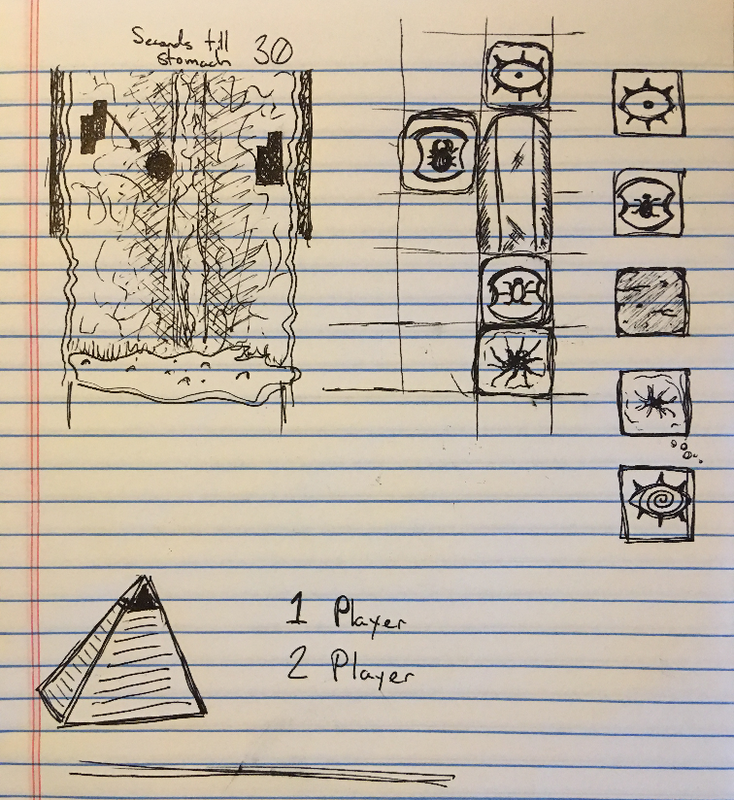 The easiest way I can come up with to describe the game I'm planning to make this Wizard Jam is, a breakout versus game where you control your own group of blocks and you are trying to get hit. I am still ironing out some gameplay stuff to see what is best for pacing and balance so things may change. As the title implies, at least to me, you are a sarcophagus falling down a giants esophagus. As you slide down towards the stomach your goal is to shoot objects in the environment that will assist you in digesting/destroying yourself before the other player is able to. At the beginning of the game you are tasked with building your esophagus 'clump' in whatever layout you want, however you are required to include a certain number of blocks. These blocks have a variety of functions, one allows you to fire a projectile to interact with other objects tumbling down, one acts as a traversal block which allows you to move around in the space, etc. I want to also include a single player mode but haven't quite figured out how that will work yet. Appropriately the aesthetic I am going for as I described in slack is "medieval gross". So, kinda dark and dirty, but because you are sliding down an esophagus it will be gross. I foresee the gameplay of this game to be a bit of an adventure, so I'm looking forward to discovering fun and also terrible experiences along the way. Hopefully I can remember to document them here! Sounds great! Like gross Downwell head-to-head or something. 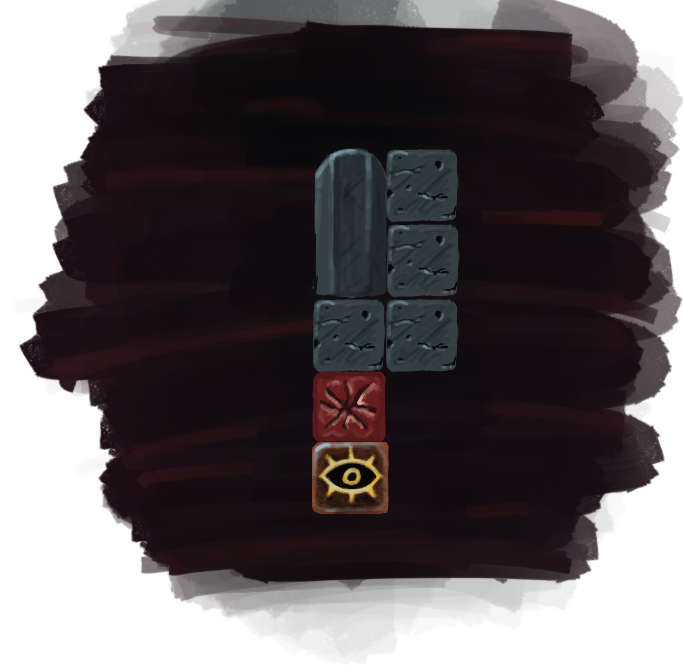 Here are some early drawing of the blocks. Hopefully I found "medieval gross". Here is an early concept of the blocks builder. Before the game starts the players will have a required number of blocks they have to use, and they can lay them out in anyway they please. They will then go into the esophagus where they must shoot digestion acid balls to bounce them around the level, and they then let them hit them to essentially digest their blocks and themselves. This art is great (and gross)! Digging those sketches, too. I must admit getting 2 players into this was scaring the sarcophagi out of me as it's the first time I've done synchronous multi-player but it went in pretty well. I was surprised things worked inside the loadout manager as well as they did as I'm saving the data for both players in the same list<>. I'm now thinking of doing 2 modes. Very likely not by the end of the jam, but sometime. The more theme appropriate mode is where you are trying to destroy yourself with elemental obstacles (which is a bit light right now). The other would be a more classic destroy your enemy type thing. I may have to start focusing on the art and structure surrounding this soon. I will likely start fleshing out the environmental stuff now that I have 2 players working. I've made some headway on the art. I think it's time to go back and polish the gameplay now. Thanks for the comments everyone. I'm happy to see it's eliciting some gross and eww.